Mysti Babineau testifies. HF70 author Rep. Mary Kunesh-Podein sits to her right. Mysti Babineau, an enrolled member of the Red Lake Nation, endured horrific trauma growing up, one of many unknown stories of missing and murdered indigenous women and girls. Babineau is a survivor who lived to tell her story. 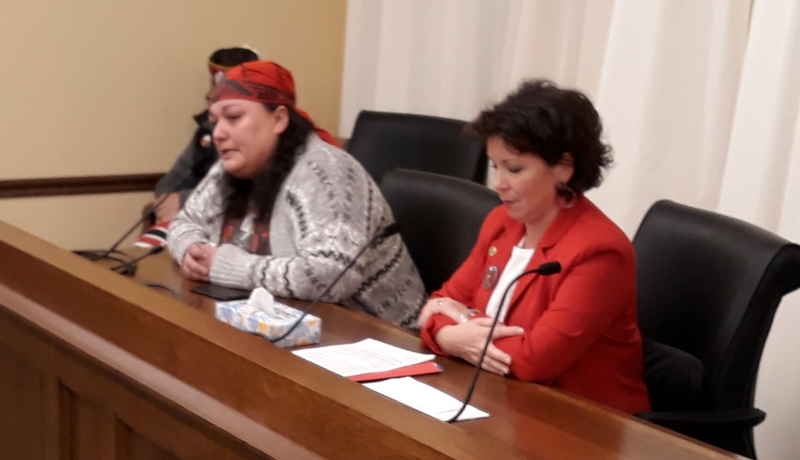 Babineau and other indigenous women shared their painful stories to gain support for HF70, a bill carried by Rep. Mary Kunesh-Podein (D-New Brighton) to create a Task Force on Missing and Murdered Indigenous Women (MMIW), a beginning step in addressing this ongoing crisis.